Wisdom teeth (third molars) generally erupt between the ages of seventeen and twenty-one. When these teeth are erupting normally (not impacted), and there is sufficient room in the jaw to accommodate them, they can be properly functioning teeth. When there is insufficient room or they are not correctly aligned, an evaluation should be made regarding their removal. Wisdom teeth that are only partly erupted will have an opening for bacteria to lodge around the tooth and gum causing an infection. The result is pain and swelling of the area around the tooth which can also spread to encompass a larger area of the jaw and neck. Unerupted and partially erupted wisdom teeth can cause damage to the adjacent teeth. Decay and loss of bone structure can result from the inability to clean the area adequately (fig. 1). Cysts can form which will destroy the surrounding bone and roots of the teeth. fig.1 The circled area shows decay on the root of the second molar caused by the impacted wisdom tooth (1). Expectant mothers experience elevated levels of the hormones estrogen and progesterone. This causes the gums to react differently to the bacteria found in plaque, and is many cases can cause a condition known as "pregnancy gingivitis." Symptoms include swollen, red gums and bleeding of the gums when you brush. Remember that it is the bacteria in the plaque and not the hormones that cause gingivitis. Brushing, flossing and any other plaque removal aids that have been recommended will prevent gingivitis during pregnancy. Pregnancy tumors (pyogenic granuloma) are rare, usually painless lesions that may develop on your gums in response to plaque. Although they are not cancerous, they should be treated. New research suggests a link between pre-term, low birth weight babies and gingivitis. Excessive bacteria, which cause gingivitis, can enter the bloodstream through your gums. If this happens, the bacteria can travel to the uterus, triggering the production of chemicals called "prostaglandins, " which are suspected to induce premature labor. Can I receive dental treatment while I'm pregnant? Good oral health is vital during your pregnancy. Continue with your regular dental cleaning and check-ups to avoid oral infections that can affect the fetus, such as gingivitis and periodontal disease. Major treatments that aren't urgent can be postponed until after the child is born. Emergency treatment can safely be done during pregnancy. One should be cautious of all drugs during pregnancy. Local anesthetics such as novocaine or lidocaine can be taken safely. If antibiotics are needed to treat an infection, many can be safely taken. For pain products containing acetaminophen, such as Tylenol, are approved, but you should be wary of other over-the-counter medications such as aspirin or ibuprofen. Avoid using narcotics for pain until after the child is born. Oral cancer is the sixth most common cancer, accounting for 3.6 percent of all cancers diagnosed in the United States. It is felt that most oral cancers develop from exposure of mouth tissues to topical carcinogens, predominantly alcohol and tobacco products. Male cigarette smokers have a risk for developing oral cancer 27.7 times greater than males who never smoked; the rate among women who smoke is 6 times greater than non-smoking women. The average age at diagnosis is 60 years. Part of a regular dental check-up is an oral cancer screening in which all the soft tissues of the mouth are examined for any sores, discolored tissue, and lumps. You can help prevent oral cancer by avoiding smoking and not drinking excessive alcohol. When tobacco and alcohol use are combined, the risk of oral cancer is 15 times more than for non-users. Early detection is important for successful treatment. A sharp pain when biting that quickly goes away is often indicative of a cracked tooth. A crack is a defect in the tooth structure; often these cracks are not visible to the eye, nor do they show up on x-rays. Diagnosing a crack in a tooth is sometimes a difficult task as it is often hard to tell which tooth hurts or even if the pain is coming from the top or bottom teeth. A cracked tooth hurts because the pressure of biting opens the crack, allowing the pulp within the tooth to become irritated, resulting in a sharp pain that will usually quickly diminish as the pressure on the tooth is released. Eventually an untreated tooth with a crack will break. How the tooth breaks will dictate the course of treatment. A severely broken tooth might need to be extracted. A restoration such as a crown might be able to restore the tooth. Occasionally root canal treatment will be needed. The best course of treatment is to make the correct diagnosis before the tooth breaks. In most cases a crown is placed on the tooth to brace the tooth and prevent the crack from opening, preventing the irritation of the pulp and the resulting sharp pain. The crack down the side of this tooth was causing a sharp pain when biting. By placing a crown on this tooth it was restored to normal function. Mouth sores have numerous causes. They can be the result of such irritations as ill-fitting dentures, loose orthodontic wires, or a sharp edge from a broken tooth or filling. They can also be caused by infections of bacterial, viral, or fungal origin. Any mouth sore that persists for more than a week should be examined and possibly biopsied. Canker sores (aphthous ulcers) are those small but painful sores that occur inside the mouth. The sores are characterized by small ulcers with a white base and red borders. They usually errupt on the cheeks, tongue, floor of the mouth, or gums, and range in size from a pinhead to a pea. Approximately twenty percent of the population is affected. Their appearance may be related to fatigue, stress, cuts (from biting the cheek or tongue), and diet. It is felt that they are caused by bacteria and, once contracted, they will recur. Canker sores are not contagious and will heal in eight to ten days. Treatment is usually symptomatic; by placing various over-the-counter topical anesthetics on the ulcer it can be made less painful. The relief is temporary, but it will make eating more comfortable. Avoiding hot, spicy, or acidic foods will keep the irritation from getting worse. Cold sores (fever blisters) are composed of groups of painful, fluid-filled blisters that often errupt around the lips; they are not present inside the mouth and thus can be distinguished from canker sores. Cold sores are caused by the herpes virus type I and are contagious. The first infection (primary herpes) may occur without any symptoms or may be confused with a cold or flu. Once a person has a primary herpes infection the virus stays in the body, causing occasional recurrent attacks which may follow a fever, sunburn, skin abrasions, or emotional upset. The blisters usually heal within a week. Topical anesthetics can provide temporary relief and provide comfort while eating. Leukoplakia is a thick, whitish-colored patch that forms on the cheeks, gums, or tongue. It is caused by excess cell growth and is common among tobacco users. It can also be caused by irritations such as chewing on one's cheek or ill-fitting dentures. Leukoplakia can progress to cancer so it should not be ignored. The first step in treating leukoplakia is removing the contributing factors; for some it is quitting tobacco use, for others it means replacing ill-fitting dentures with ones that fit properly. Often a biopsy is required to rule out a cancerous condition. Candidiasis or moniliasis is a fungal infection caused by the yeast Candida albicans. It causes creamy and red patches to form on the moist surfaces of the mouth. Tissues under the patches can be painful. It is common in denture wearers and in people with debilitating diseases. It is common after antibiotic treatment when the normal bacteria in the mouth have been decreased. Treatment consists of controlling the conditions that cause the infection. Antifungal medications are helpful to gain control of the condition. A traumatic facial injury caused by a car accident, sports injury, or an altercation can result in damage to one's teeth. An avulsion (having the tooth and root structure forcibly knocked from the jaw bone) or subluxation (having the tooth loosened and possibly malpositioned, but retained in the jaw) is an injury requiring immediate attention. If the tooth is knocked out of the mouth, it should be found and placed immediately in a non-acidic fluid such as water or milk and transported immediately with the patient to a dentist for treatment. The probability of successfully reimplanting the tooth diminishes proportionally with the time the tooth is outside the mouth. If successful, the treated tooth will be retained indefinitely. 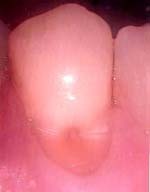 The possibility of resorption of the root structure is an unpredictable complication of this type of injury. Treatment normally entails assessing the viability of the tooth and root and the condition of the tooth socket. The tooth will then be placed back into the tooth socket. Root canal therapy will normally be necessary and temporary splinting (attaching the tooth to ajacent teeth for stabilization) will be needed. Periodic x-rays are needed to assess the roots for evidence of resorption. If the tooth is subluxated, treatment will consist of repositioning the tooth into normal alignment, and possibly splinting to the adjacent teeth if needed for stability. Future assessment of the nerve of the tooth will dictate if additional treatment is necessary. Teeth can become sensitive when the enamel (the outer layer of the tooth) is missing from the tooth, exposing the dentin (the inner layer) to the elements. Microscopic tubules located within the dentin can then transmit sensations of heat, cold, and other irritants which stimulate the nerves and cells within the teeth causing hypersensitivity. This usually occurs where the gingiva (gum) and tooth meet, and can be caused by abrasion (usually caused by using a hard toothbrush), chemical erosion (from acidic foods and drinks), or bruxism (grinding one's teeth). As part of diagnosing the cause of the sensitivity and planning what treatment is needed, it is first necessary to rule out other dental problems such as decay, fractured teeth, periodontal disease, and damage to the pulp of the tooth. Once other causes for the sensitivity are ruled out, treatment can be instituted. The first approach is usually to use a desensitizing toothpaste. There are several commercial brands available such as Sensodyne® and Crest® Sensitivity Protection. These toothpastes contain compounds that help block transmission of sensations from the tooth surface to the nerve. It usually takes about a week of using these products to achieve an effective therapeutic level. If the sensitivity is from an erosion of the tooth, this area should be bonded. An erosion (fig. 1) can be seen as a worn or ditched-in defect in the tooth structure where the tooth and gingiva (gum) meet. By bonding (fig. 2) the tooth, the dentinal tubules become sealed so that they no longer can transmit sensations to the pulp, and the worn tooth structure is restored (filled in), thus preventing further wearing of the tooth. fig. 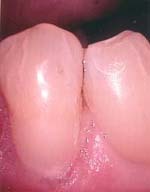 1 The worn area on the tooth, near the gingiva, has become sensitive due to the exposed dentin. fig. 2 By bonding this area the dentin is sealed and covered, preventing the transmission of pain and the further wearing of the tooth structure. Bruxism is the tendency to gnash and grind one's teeth. It is usually done on a subconscious, reflex-controlled level with the patient unaware of doing it. The etiology of bruxism is thought to be a combination of psychic stress such as overwork, worry, and tension, as well as various irregularities in the biting surfaces of the teeth. Myalgia--The jaw muscles can become painful due to their constant contraction. Occlusal wear--The constant grinding of the teeth can cause a significant loss of tooth structure from the biting surfaces of the teeth. Headache--It has been postulated that the basis for the pain or ache is caused by a disturbance in the circulation in the muscles. There are a number of ways to treat bruxism. When stress is the major cause, a conscious effort to deal with and find ways to relieve the causes of the stress is needed. Since bruxism often takes place during sleep, a plastic mouth guard is often constructed. This is worn to prevent the teeth from grinding against each other. If this condition is allowed to persist for many years, the teeth can be worn significantly enough to require reconstruction. Moist heat applied to the affected jaw muscles and anti-inflamatory drugs are also often helpful. The use of muscle relaxants is also sometimes effective. A properly constructed, well fitting mouth guard will provide protection to the teeth and prevent injuries to the lips, face and jaw. Any athlete involved in an activity that has the potential for facial injuries from contact should wear a mouth guard. This also includes sports other than football, such as basketball, soccer, and hockey. I personally have seen more fractured teeth and lacerated lips from basketball and soccer, where mouth guards are not required, than from football, where mouth guards are required to be worn. A custom-made mouth guard constructed in the dental office has many advantages over the store-bought version. A custom mouth guard is constructed from an impression of the teeth and is custom made to provide a precise fit, molded to the athlete's unique dental structures. In addition to offering protection to the lips, jaw, face, and teeth, a custom-made mouth guard is more comfortable, provides an increased intake of oxygen (there is less airway blockage), and improves speech (because of secure fit and less bulk), over the store-bought version. The excessive use of antibiotics has led to the development and spread of antibiotic-resistant bacteria. This is of major concern when a serious infection develops and the bacteria are resistant to the antibiotic of choice because of prior misuse of the drug. Antibiotics should not be used for viral infections, such as the common cold or the flu, because viruses are not destroyed by antibiotics. Antibiotics should not be used for well-defined, limited infections that are being controlled by the body's immune and inflammatory systems. Antibiotics do not prevent infections and should not be used prior to a surgical procedure for that reason. An exception to this would be patients with certain heart conditions when an antibiotic is given to prevent bacterial endocarditis. Because they are one of our most important defenses against disease, antibiotics should be reserved for treatment of non-localized infections, when their use will prevent the spread and help in the resolution of the infection. An enormous natural reservoir of antibiotic-resistant genes has been created by man's abuse of antibiotics. To understand the serious nature of this fast-emerging global crisis, we must first understand the ubiquitous nature of antibiotics in man's ecosystem. Antibiotics are routinely given to animals and plants that comprise the human food chain. Animals receive antibiotics in their food as "growth enhancers" as well as therapeutic doses to prevent infection. Agricultural crops, including fruit trees, are sprayed with antibiotics; and throughout the world, human and animal manure containing antibiotics is used for fertilization. The result is that the ingestion of meat, vegetables, and fruits entails ingestion of antibiotic residues and bacteria harboring antibiotic-resistant genes. Microbes have proven to be masters of genetic engineering. Bacteria can now collect and exchange genetic information, such as antibiotic-resistant genes, with extraordinary ease. The abuse and misuse of antibiotics should be a concern for everyone. An understanding of the consequences of their misuse can help prevent the creation of resistant bacteria, making antibiotics effective when their use is warranted. Orthodontics is a special discipline of dentistry concerned with aligning the teeth and jaws to improve one's smile and oral health. Braces are placed on teeth to correct a malocclusion. Malocclusion refers to crooked, crowded, or protruding teeth that do not fit together properly. Malocclusions are usually hereditary, but can also be acquired through thumbsucking, premature loss of teeth, injury to the mouth from trauma, or other medical problems. It is never too late to have a malocclusion corrected. Today one out of four orthodontic patients is an adult. The most common age for the placement of braces is between ten and fourteen years of age, after the loss of the primary teeth. There are occasions when beginning a first phase of treatment at an early age can shorten or in some cases eliminate the need for braces at a later date. Braces are usually worn for about twenty-four months. Following the completion of treatment a retainer will need to be worn to maintain the position of the teeth. Oral hygiene is very important during the time that braces are on the teeth. Poor hygiene can cause staining and decalcification of the enamel around the bands and brackets on the teeth. This can lead to decay and discolored teeth when the orthodontic treatment is finished and the bands are removed. Careful brushing and flossing (with the help of a floss threader), in addition to a regular professional cleaning every six months, will prevent esthetic disappointment associated with poor hygiene. There are dietary guidelines that are important. Cutting back on the amount of sugery foods such as candy and soda will minimize the generation of acids and plaque that can cause tooth decay and gum disease. To prevent damage and breakage to the braces, hard, sticky, and crunchy foods like nuts, hard candy, ice cubes, and gum should be avoided. Thanks to new techniques and technologies, braces are less obtrusive and more comfortable than in the past. For the adult patients this means a more esthetic appearance during treatment which can reduce the amount of self-consciousness that one might otherwise feel. Dry Mouth or Xerostomia is due to insufficient secretion of saliva, a common side effect of one of more than 400 drugs, both prescription and over-the-counter. The ones usually responsible for dry mouth include decongestants, diuretics, antihypertensives (blood pressure medication), antidepressants and antihistamines. Other causes of Xerostomia include cancer treatment, autoimmune diseases, anxiety, and depression. If it is due to medication, inquire if there a substitute that doesn't cause dry mouth. Sip water frequently during the day, and keep a glass of water at your bedside at night. A little lemon juice added to your drinking water should stimulate saliva flow. Avoid both salty and sugary foods. Chew sugarless gum or eat sugarless hard candy. Avoid alcohol (and mouthwashes that contain alcohol), caffeinated beverages and tobacco. Avoid spicy or highly acidic foods. Eat fruits and vegetables that have a high water content such as celery, apples and melons. Try commercial saliva substitues to help keep your mouth moist. It is important to make an extra effort to keep your teeth and gums free of plaque by being meticulous in your flossing and brushing techniques. It is estimated that 12 to 14 million people in the United States have diabetes, but only half of these individuals are diagnosed. Studies have shown that diabetics are more susceptible to the development of oral infections and periodontal disease than those who do not have diabetes. Oral infections tend to be more severe in diabetics than non-diabetics. Those diabetics that do not have good control over their blood sugar levels tend to have more oral health problems. These infections occur more often after puberty and in aging patients. Diabetics may experience diminished salivary flow and burning mouth or tongue. Dry mouth (xerostomia) also may develop, causing an increased incidence of decay. Gum recession has been found to occur more frequently and more extensively in moderate and poorly controlled diabetic patients because plaque responds differently, creating more harmful proteins in the gums. Make sure to take good care of your mouth and have dental infections treated immediately. More frequent cleaning and meticulous home care are important to prevent problems from developing. Diabetics who receive good dental care and have good insulin control have a better chance of avoiding gum disease. Diabetics need to be aware of their blood sugar levels in addition to having their triglycerides and cholesterol levels checked on a regular basis. These may have a direct correlation with the chances of developing periodontal disease. Latex is a natural rubber harvested from trees and can be found in more than 40,000 consumer products, from household items to toys. Examples of these items include teething rings and pacifiers, balloons, elastics in clothing, hoses, makeup, and rubber bands. An individual with latex allergy can experience a range of symptoms, including hay-fever type reactions such as itchy, swollen eyes, runny nose, and sneezing. Hives, skin rash, and asthma are the most common reactions. As a general rule, people who are continually exposed to latex, usually at work, or have had multiple surgeries have a higher risk of developing an allergy to latex. If you suspect you have an allergy to latex, talk to your physician about getting a latex prick skin test; a positive test result can confirm latex allergy. What should I do if I am allergic to latex? Be sure to inform your dentist about your latex allergy as part of your medical history. Ask the office whether it has non-latex products available for use during a dental procedure. Sleep apnea is a serious, potentially life-threatening sleep disorder. It is as common as adult diabetes and affects more than 12 million Americans. Sleep apnea refers to episodes in which a person stops breathing for 10 seconds or more during sleep. With each episode, the sleeper briefly wakes up in order to resume breathing, resulting in extremely fragmented, poor quality sleep. Irritability and impaired mental or emotional functioning. Excessive snoring, choking, or gasping during sleep. Individuals with sleep apnea stop breathing completely for 10 seconds or more. Typically, the frequency of waking episodes in a single night is somewhere between 10 and 60. If your partner hears loud snoring, punctuated by silences and then a snort or choking sound as you resume breathing, this pattern could signal sleep apnea. While snoring and sleep apnea are related disorders, not all snorers will develop sleep apnea, and not all sleep apnea patients snore. People with this disorder are so fatigued during the day that when driving, their performance is similar to that of a drunk driver. If left untreated, sleep apnea can lead to impaired daytime functioning, high blood pressure, heart attack, and possible stroke. Apnea can aggravate patients with a weakened heart by placing stress on the heart during sleep. Treatment is based on your medical history, physical examination, and the results of polysomnography (a diagnostic test during which a number of physiologic variables are measured and recorded during sleep). Initial treatment of mild sleep apnea may be as simple as avoiding sleeping on your back. For more severe sleep apnea a nasal continuous positive airway pressure (CPAP) system is a commonly prescribed physical therapy. CPAP delivers air through a small mask that covers the nose. The constant pressure keeps the airway open, which prevents snoring and episodes of apnea. If a patient has trouble tolerating CPAP, surgery also can eliminate symptoms. Medications are generally ineffective.